A bit more volume and length! Use blinc mascara AMPLIFED on clean and dry lashes. Try not to use any moisturizers on your face before you apply the mascara since the oil may reduce the mascara's hold on the lash. Keep brushing blinc mascara AMPLIFED on until you have achieved the desired degree of lash separation, volume and length. You can build on additional volume by applying as many coats as you wish. For additional length, focus on the tips of the lashes with a few strokes of the mascara wand. 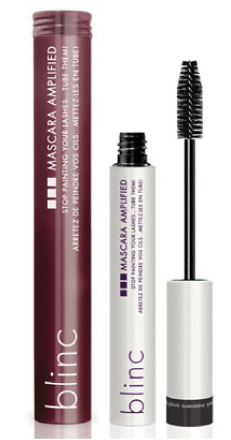 Now you can get on with your day without worrying about runny mascara. Once you have finished applying blinc mascara AMPLIFED close the bottle tightly. Make sure no mascara is left on the neck or opening of the bottle before closing it. Any residual mascara left on the opening or the neck of the bottle can lead to difficulties reopening the mascara bottle or even damage the bottle upon reopening. Be sure to clean off the bottle neck and opening of any residual mascara before you close it. Those little "tubes" you see in the sink are not your lashes; they are the mascara that encased your lashes sliding off. Do not try to use any makeup removers or lotions to remove the mascara since they will not be as effective as simply combining water and pressure.